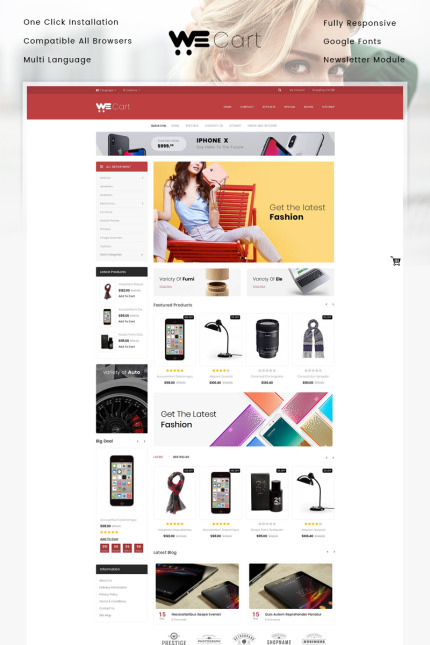 Wecart Multipurpose Store Opencart responsive template is perfectly designed for electronics, computers, accessories, fashion, food, jewelry, tools, apparel, cloths, kitchen, medicine, furniture, mega, minimal and multipurpose stores. This theme is unique and look simple for selling any types of products. This template is 100% responsive which fully compatible with all latest browser and devices. It supports multiple language and currency to sell your products worldwide. We have included quick start files with this theme to install this theme on your server with just one click.